I own the Dane and I regularly clean this piece like recommended by Albion (using Ballistol oil). If I understood it correctly the steel needs some protection from the air / humidity to prevent rust. But how are the metal parts below the guard cleaned? I mean, through the little hole (see picture) due to the ricasso rust could get there? How you guys clean these parts? Drop in a little oil? Using small cotton sticks? Or am I too worried about these things? I'm thankful for any hints or comments! My concern is also less the actual cleaning but more the conserving aspect. How to prevent rust there below / how to see if there is any rust at all which should be removed, etc. Your sword's ricasso doesn't make it more difficult to clean. It's the fuller that does that. Please see our glossary of terms for more info. 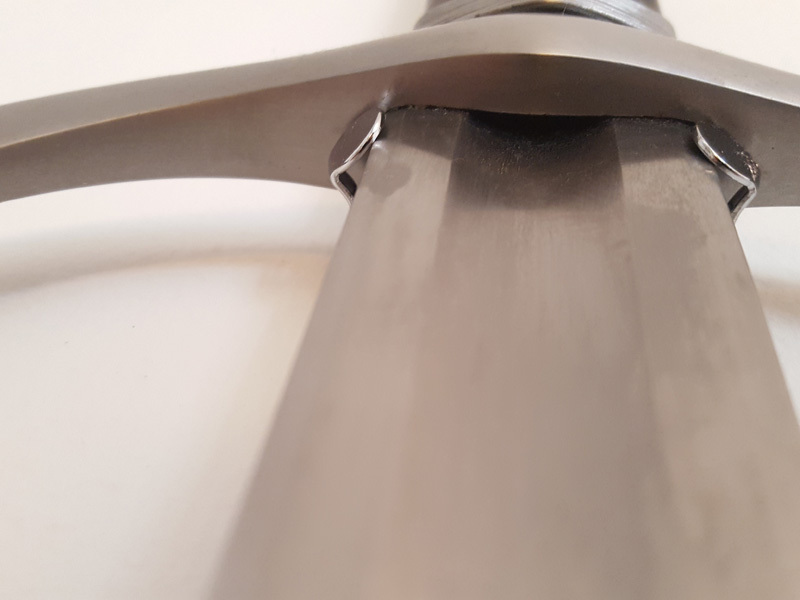 We have an article about the subject of caring for your sword: Care and Maintenance of the Modern Replica and a ton of forum topics about it as well. I personally think you're overthinking this whole thing. If you handle it or it gets moisture on it, clean it off with a rag. Oil it. Put it away. Enjoy it. No need to obsess over it. If patination or something starts to build up on the tang, it's not really a problem. If you have active rust under there, it's because you put your sword in a pool of water, buried it, or did something strange with it. If that's the case, you're out of luck because your sword is going to break in 50-250 years and you'll be out of a sword. If that doesn't sound like a big deal, as it doesn't to me, then I wouldn't worry too much about it. I certainly don't worry about it with my swords. I'd be more concerned with that metal bracket thing scratching your blade or hilt furniture. Thanks Nathan for all information and those links. The metal brackets are made from quite soft metal, it doesn't scatch the steel. Thanks for your thoughts.